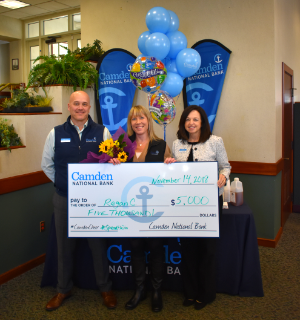 Camden, ME, November 21, 2018 – Camden National Bank recently announced the Grand Prize winner of its eight-week fall sweepstakes, Spend & Win. Regan Cahalan won $5,000 for using her debit card for everyday purchases throughout the promotional period, and she celebrated her win in November with the Camden Main Office banking center. “I had just been dreaming of going home for the holidays to see my family in Charleston, SC; but I had no idea how I'd be able to make it happen,” said Regan. “Now I can book my tickets without a worry. That's truly the best gift ever!” Regan was incredibly surprised and grateful for the prize from her community bank. Over the course of the two-month sweepstakes, Camden National Bank awarded 40 other customers with $100 each, totaling over $8,000 in prizes. The other winning customers ranged from 18 to 73 years old and were living across Maine and as far away as Arkansas.